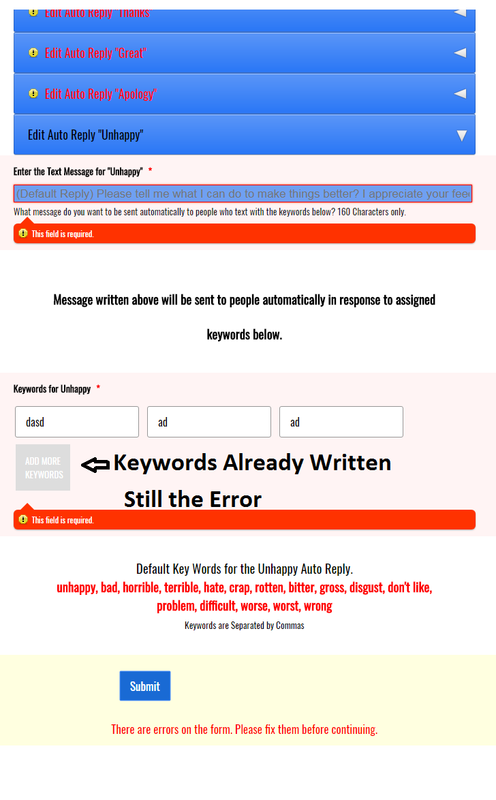 It works under "Edit Auto Reply "New Opt In" but beside that I can not understand why it still gives me an error. My fields are filled in. Can you explain more. Sure, no worries - What Kevin wanted to tell is that you haven't clicked the ADD MORE KEYWORDS button yet thus explaining why the form says "The field is required". You have to click the button first to add the keywords before the widget is considered as filled out. Got it Thanks, Now this makes me to change the text from "Add more Keywords" to "Click to Save", that I did but I'm not able to change the color of that button. Please help. "Background" is for the button's color and "Color" is for the font, feel free to replace the colors with the ones you need on the button and/or remove the "color" if you need to keep the current one. Just a quick question, Do I have to do this every time the widget is being called in the form? Yes, each time you add an infinite list you will need to add the CSS for that specific widget.